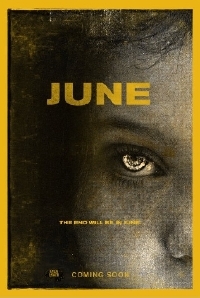 Directed by L. Gustavo Cooper (The Devil Incarnate), June is an stylish new possession flick that looks like it goes into some pretty wild directions. The film stars Kennedy Brice (â€œThe Walking Deadâ€), Casper Van Dien (The Pact, Shiver), Victoria Pratt (Patient Killer), Eddie Jemison (Oceanâ€™s Eleven) and Lance E. Nichols (The Curious Case of Benjamin Button). JUNE is hitting DVD and on Digital on Oct. 6, 2015. JUNE tells the story of nine-year-old June who has been shuffled in and out of foster homes for years. And though she tries to be good, no matter where she goes, a trail of chaos and terror seems to follow. Itâ€™s only when June is sent to live with a new couple, Lily (Pratt) and Dave (Van Dien), that it looks as if things might finally work out. Except this innocent child with the face of an angel is possessed by an ancient, malevolent entity that has hijacked her soul. Unless June can defeat the demon within, her new family â€“ and mankind itself â€“ are destined for destruction. We're chatting with June star Casper Van Dien later today, so watch for that interview later in the week.